I have a dissenting opinion. Showing grotesque images may be counterproductive in the long run. There is a possibility that it gets to a point where people will just ignore the pictures and they don’t arouse the desired results. I will give you to examples that I think support my thesis. I may be guilty of false analogy, just maybe, I don’t know but hear me out. 1. There are bombings almost on a daily basis in Somalia; in the beginning it is a real concern you keep asking when will this idiots stop killing each other then it gets to a point where you say let the idiots kill themselves for all we care. 2. Imagine a case of a man whose responsibility is lashing prisoners. Don’t you agree with me that with each successive lashing, he loses a part of his humanity. He becomes a worse person daily with each person he has to punish. Lastly, the perpetrators of such heinous acts will not be moved by the photos, gory or not and as such showing the photos, though would be disturbing to our sensibilities doesn’t in a big way change much. Whether I see the photos or I don’t, I still can feel sympathy and empathize with all the dead and their families. In the same way, I didn’t see any photos of the shooting in the elementary school earlier in the year but that didn’t diminish how I felt about the incident. I don’t think that your analogy is a false one, so there’s no problem there. I just think we have different ideas. First, about the bombings in Somalia. I have little empathy for these bombings precisely because I’ve never seen any pictures of these atrocities. Perhaps in your country it is common to show gruesome pictures of these bombings, but in the city where I grew up, Toronto, they rarely showed pictures of bombings from anywhere except Iraq and Afghanistan. Further, the pictures of Iraq and Afghanistan were, from my recollection, always quite tame: a man with a grimacing face and some specks of blood on his cheek, or a bomb scene with all the individuals already cleared away. 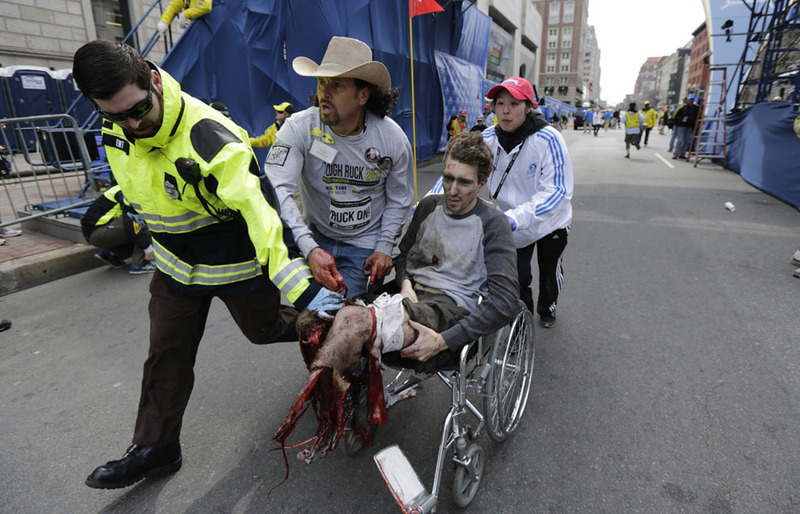 So as a result, I could never feel much empathy for the bombing victims.. The second point, I’ll have to admit, I didn’t quite understand. If you could explain the man lashing prisoners problem a little more that’d be great. But, does it desensitize us? I had not seen this picture anywhere else so my first reaction was “Unbelievable.” Not unbelievable in that it couldn’t have happened, but that something like this DID happen to a person who was there. All the reports of injuries and amputations kind of goes in one ear and out the other, but to actually see what the bomb did to one individual definitely makes me realize its extent. And then multiply what happened to this man many times over.